ATLANTA, March 17, 2017 /PRNewswire/ -- Aaron's, Inc. (NYSE: AAN), a leading omnichannel provider of lease-purchase solutions, and its divisions Aaron's and Progressive Leasing, provided the home furnishings this week for a Surprise Home Presentation to Snellville, Georgia resident Lula Jobir and her son as part of Homes for the Holidays (HFTH) program sponsored by former NFL star Warrick Dunn and Gwinnett Habitat for Humanity. Georgia resident Lula Jobir and her son receive the keys to their new Habitat Home from former NFL star Warrick Dunn, founder of Warrick Dunn Charities (WDC), as part of the Homes for the Holidays (HFTH) program. Aaron's, Inc. filled the Jobir's home with furniture, electronics and appliances and has been a longtime supporter of WDC initiatives. Aaron's began contributing home furnishings, appliances and electronics to the WDC Homes for the Holidays program in 2003. 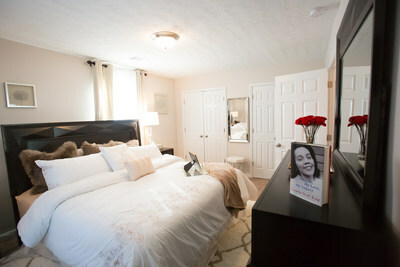 This featured bedroom is one of the rooms that Aaron's, Inc. filled with furniture, electronics and appliances in Georgia resident Lula Jobir's new Habitat home. The home, filled with furniture, electronics and appliances from Aaron's, Inc., was unveiled during a surprise presentation as part of the Warrick Dunn Charities (WDC) Homes for the Holidays (HFTH) program. Aaron's began contributing home furnishings, appliances and electronics to the WDC Homes for the Holidays program in 2003. "Aaron's is excited to continue our meaningful partnership with Warrick Dunn Charities to help make a difference in single parents' lives across the county," said John Robinson, CEO of Aaron's, Inc. "It's clear that Lula has worked hard to achieve her dreams and we're proud to contribute to her and her son's bright futures by furnishing her new home with beds, furniture, electronics and appliances." Warrick Dunn Charities' (WDC) Homes for the Holidays assists single parents in becoming first-time homeowners by providing the materials necessary for long-term stability and the provisions required to ensure that both parent and children can thrive educationally, socially and economically. To date, in partnership with Aaron's and Habitat for Humanity affiliates, WDC and its sponsors have rewarded 154 single parents and over 400 children and dependents with the American Dream of first-time homeownership in 15 cities across the nation. This fall marks WDC's 20th year in assisting single parents and their families through the Homes for the Holidays program. Lula Jobir arrived in the United States 16 years ago as an Ethiopian immigrant seeking asylum from the country's harsh politics, gaining her U.S. citizenship in 2011. She is moving out of a two-bedroom apartment she lived in with her mother, sister and son, with whom she shared a room. She works as a certified animal care tech at Emory University. "Our fundamental goal at Warrick Dunn Charities is to provide single parents with financial stability and, thanks to Aaron's, these families are able to begin their new lives with homes full of furniture, electronics and appliances," said Dunn. "I began this charity as a tribute to my mother's dream of home ownership and Lula embodies that dream with her dedication and unwavering enthusiasm every time she talks about living in her family's new beautiful home." Aaron's has been a longtime supporter of WDC initiatives and began contributing home furnishings, appliances and electronics to the Homes for the Holidays program in 2003. Warrick Dunn Charities, founded by former NFL star Warrick Dunn, was registered as a 501(c)(3) nonprofit organization in 2002. Warrick Dunn Charities provides hope and healing to communities through innovative programming inspired by our Founder's life journey. Since 1997, the Homes for the Holidays program has rewarded 154 single parents and over 400 children and dependents that have achieved first-time homeownership in Atlanta, GA, Baltimore, MD, Baton Rouge, LA, Dallas, TX, Jacksonville, FL, Tallahassee and Tampa, FL Serving single-parent families nationwide, WDC and its partners have combatted poverty, hunger and ensure families have basic necessities and comfortable surroundings to improve their quality of life. For more information, visit www.wdc.org.